Galaxy S4 coming February 2013. CompanionLink will sync with S4. Fresh on the heels of the iPhone 5 announcement, Samsung announces the Galaxy S IV device will debut February 2013 at the Mobile World Congress. Our website will have all the latest on Galaxy S4 support as the launch nears. How Will You Sync the iPhone 5? Most of the tech news today is focused on Apple’s announcement of the new iPhone 5. The new device is stunning and we’re just as excited as you to get our hands on one. As we have with each new iPhone release, CompanionLink is fully committed to supporting sync with the iPhone 5 as soon as it’s available. What exactly does that mean? DejaOffice is a business-friendly CRM app for the new iPhone 5 that includes contacts, calendar, tasks, notes, and expense capabilities. Why use DejaOffice instead of the native iPhone 5 apps? It’s simple: DejaOffice was built to support advanced CRMs like Sage ACT!, Lotus Notes, Salesforce.com, and Outlook Business Contact Manager (just to name a few). DejaOffice supports color-coded categories. Many CRM systems use color categorization to keep data organized. 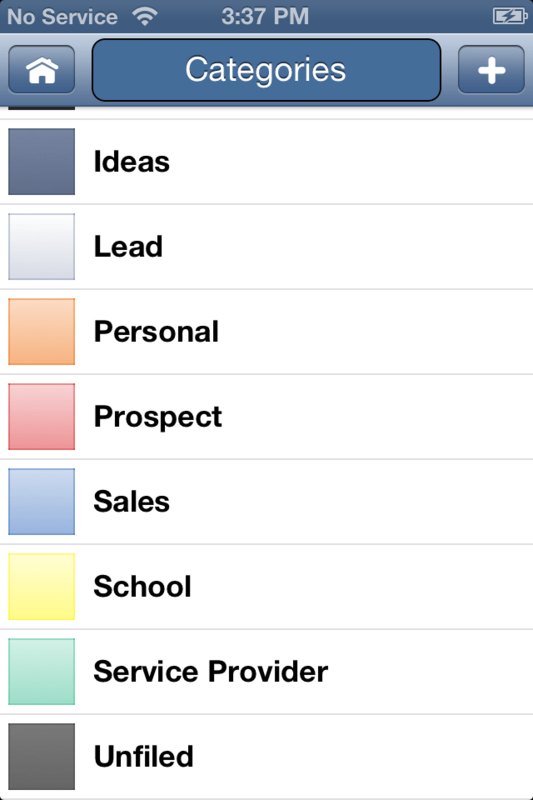 CompanionLink supports the syncing of categories and their respective colors to DejaOffice on the iPhone 5, allowing you to filter and sort your records by category. DejaOffice keeps your private data safe and secure – password protect sensitive records in your database. Records can be masked with asterisks ******** or hidden completely. Link contacts with calendar events, tasks, notes, and expenses like a true CRM. Linked records sync back to your CRM with the link intact. DejaOffice allows your data to sync with the native Apple contacts and calendar, so features like caller ID and calendar alarms still work fine. 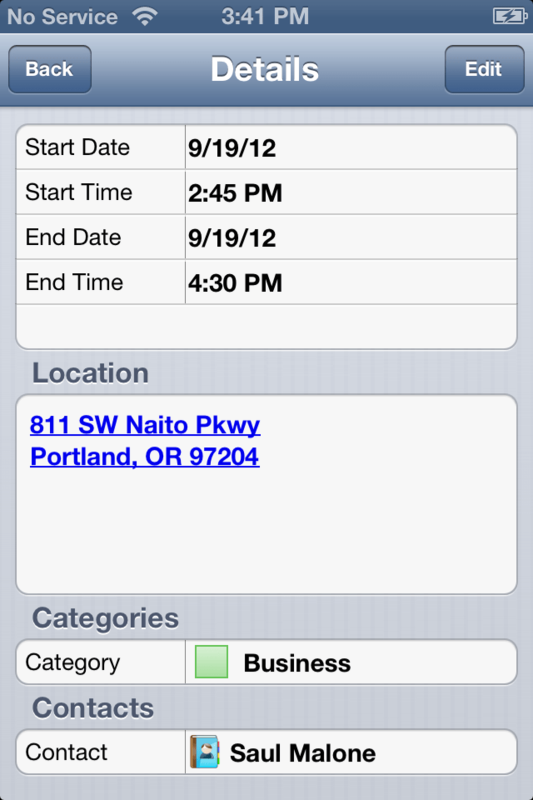 We’re currently working on adapting DejaOffice to the larger screen on the iPhone 5. We’ll be ready for launch day! iCloud has been a success for Apple ever since it launched not too long ago. This is great if you work from a Mac, but what if your business data is in a CRM like ACT! or Palm Desktop? CompanionLink can sync your PIM or CRM data to the iCloud folders in Microsoft Outlook. This means that your data will automatically sync with the iCloud service and your new iPhone 5, allowing you to access your business data while benefiting from the convenience of iCloud. iCloud is great as long as you stay within Apple’s ecosystem, but what if you want to venture out and pick up an Android tablet or Kindle Fire? CompanionLink is currently working on our own cross-platform cloud service call DejaCloud. When it becomes available, DejaCloud will allow you to keep your PC, iPhone 5, and Android devices all seamlessly in sync. We expect DejaCloud to become available for iPhone 5 this winter! 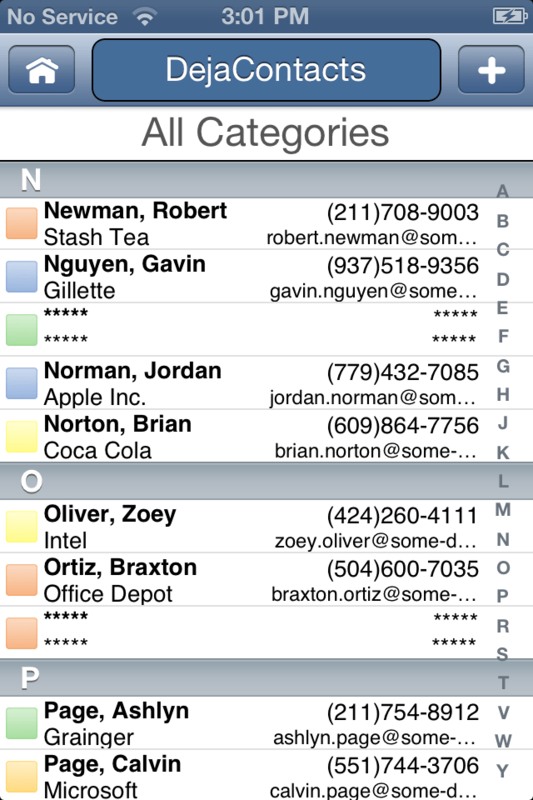 CompanionLink can sync iPhone 5 with a wide variety of PIM and CRM databases. DejaOffice preserves your CRM data, and makes it easily accessible, even when offline. Why choose CompanionLink and DejaOffice for your CRM? iPhone 5 with Sage ACT! This is a big day for CompanionLink. Gene Marks, contributor for Forbes.com, mentioned CompanionLink in the same article as some heavyweights such Amazon, Evernote, and Square. The article is about Gene’s top 9 apps that he recommends salespeople must have on their smartphones. This is not a new company or two dudes working out of a garage. My clients and I have used CompanionLink’s products for a decade. I also like the fact that they’re not in bed with any one software maker – they make synching products for them all. CompanionLink has always felt there is strong value in offer mobile business professionals a reliable and platform-agnostic way to integrate their phones with their business contacts, agenda, and notes. Our mantra has always been “Your data, your device.” We’re proud to support the entire spectrum of major mobile platforms and let you choose which device to use and how you wish you keep your data integrated. We do it with integrity and without farming or selling your data to advertisers because we feel that’s what business professionals really want. Today’s mention by Gene was a testimonial for our mission. Thank you, Gene. Android is the brand of choices. They let you pick your carrier, color, and device maker. Android offers options and flexibility. Apple iPhone is the brand for a magical ecosystem that works in harmony if you use their phone, apps, and computers. The user experience is unparalleled. And Windows Phone plans to make a dent…? They can indeed. The answer lies in looking at the past and coming to terms with their core. Once upon a time, people preferred the old Microsoft Windows Mobile devices over popular BlackBerry and Palm Treo options because of the tight integration Microsoft delivered with business software like Exchange, ActiveSync, Microsoft Outlook, Word, Excel, and other business apps. Windows Mobile shipped with a fluent user experience (much like Apple today) if you lived within Microsoft’s software, back-end, and phones. The key to Windows Phone 8 making a dent is to reintroduce tight integration to their own business software suite of Microsoft Office. It’s surprising (and ridiculous) this even needs to be stated. Here’s an 86-page(!) and growing thread of frustrated people who just want their old ActiveSync desktop client back for plain old USB sync between a Windows Phone and Microsoft Outlook. This is yester-year’s technology folks! No breakthrough needed — just bring it back! T-Mobile and Walmart are offering the Samsung Galaxy S2 off-contract for $299. You sign up with T-Mobile’s new unlimited internet access (data) and texting for just $30 per month. No annual subscriptions. That’s a great offer for people averse to contracts. Granted, the S2 is an older phone. But it is one of the most popular Android devices ever! Folks will need a way to load their contacts and calendar events on their S2. CompanionLink offers software to load your S2 with data from popular PC apps like Microsoft Outlook. The 14-day trial is free and offers unlimited data sync. If you wish to continue synchronizing, prices start as low as $14.95. Will Nokia and Microsoft introduce first Windows Phone 8 device on September 5, 2012? Fresh off of Samsung’s Galaxy Note 10.1 announcement, Nokia and Microsoft have sent out invitations to a joint event to be held in New York on September 5. Will this be the unveiling of the first Windows Phone 8 device? Instead of fleeing to Android like every other device manufacturer has, Nokia has double-downed on the Windows Phone platform. This presents a high-risk/high-reward situation for a company that is slowly climbing out of a financial slumber brought on by the onslaught of iPhone and Android. Nokia is to the Windows Phone platform what Samsung is to Android. Inconclusive is whether Windows Phone 8 really goes mainstream. There exists a huge open niche in the business market. BlackBerry is quickly losing their foothold in mobile business because of their antiquated operating system. Android and iPhone have chosen to primarily focus on the consumer crowd by emphasizing audio, video, social media, and gaming. Windows Phone 8 has an opportunity to take cater squarely to business people who have been forced to kludge together apps and solutions to get a business tool that works for them. Wouldn’t a business mobile device be a great fit with Microsoft’s bread winner, Microsoft Office? CompanionLink is watching Nokia and Microsoft closely. As CompanionLink pivots to mobile business CRM, we’re hoping Windows Phone 8 aligns with business people also. Yes, we’ll be there to support them. Like Nokia, we may even double-down.